Smokey Road | Just Shooting Memories! I finally have internet back. Oh, how I have missed my internet. It is so hard to make it to anywhere that has internet where I can use my computer and not another persons. If you have not figured out, I have really taken to the HDR technique. I had found it several years ago, but never found any photos that I really liked and the process at the time was very hard, at least to me. At the time, I used the trail version of photomatix. It was easy to put the photos in, but getting something out which was not over-processed was not exactly the easiest. Then, last year, I was listening to Leo Laporte, if you have never listened to him, he is the “Tech Guy”… I started watching him on TechTV and then found him again on radio about six or seven years ago… yes, I am a geek and proud of it. So, I was listening and Leo had this photographer on, Trey Ratcliff, he was talking about HDR, but what really caught my attention was his use of a 50mm prime lens. I happened to write Trey’s website down, stuckincustoms.com. I got on the internet, researched 50mm lenses and as an afterthought entered Trey’s website. I was amazed by the photography and to beat it all, he had a FREE tutorial. Now that is the right price. From there, I began working the HDR learning process. From what I hear, most people go through a time period when most photos are “over-processed”. I had this same trouble, and would argue sometimes that I still do. However, HDR is still just a processing technique and the photo has to have a composition quality that people want to see. This photo is from the Apple Festival car show in Ellijay Georgia. This car show happens every year on the second Saturday in October. 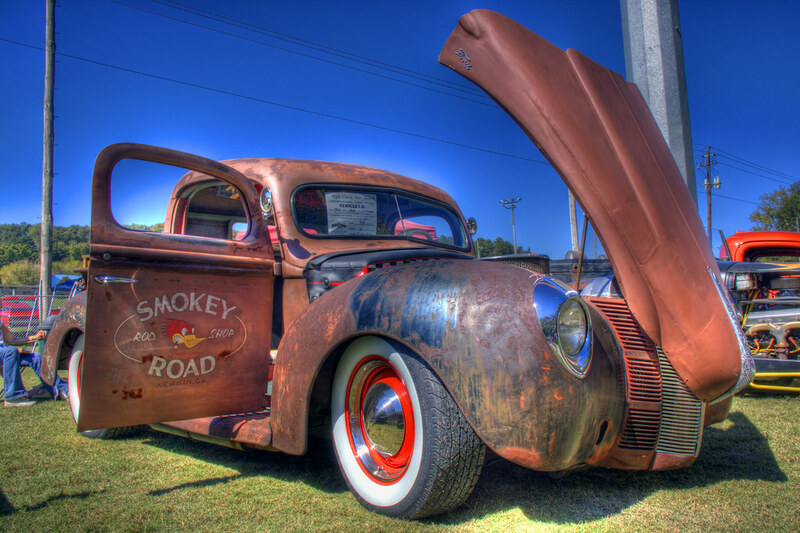 This was my first car show after learning the HDR process. I just loved all the cars and even better was the fact that at this show, they were all labeled. Why can’t more shows label the entry cars?